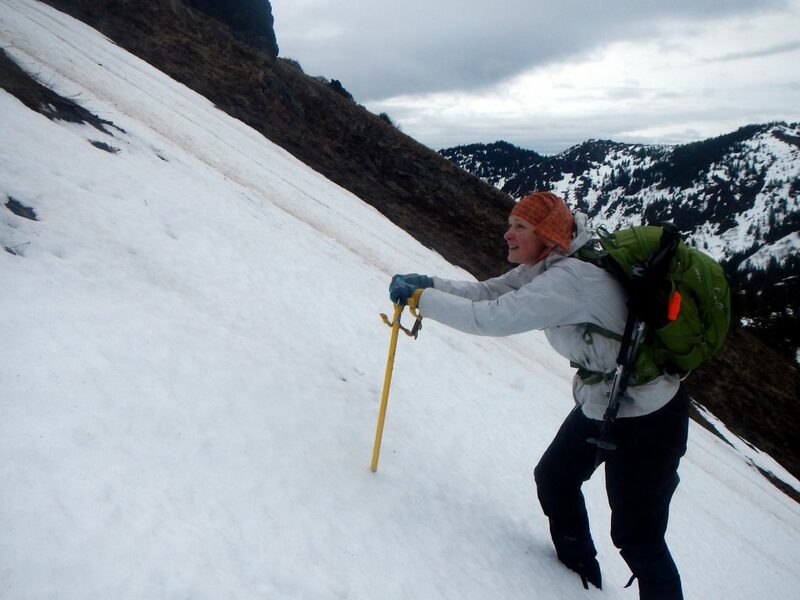 For the past three years I’ve attempted to use the steep-sided Cone Peak as a snow skills training ground. First, with Aaron and then with my hiking group as training for Mt. St. Helens. It’s a short, but steep snowfield in the right conditions. We’ve had some pretty low snow years but this year would not disappoint. In the morning it was warm and damp, with melting snowpatches everywhere. 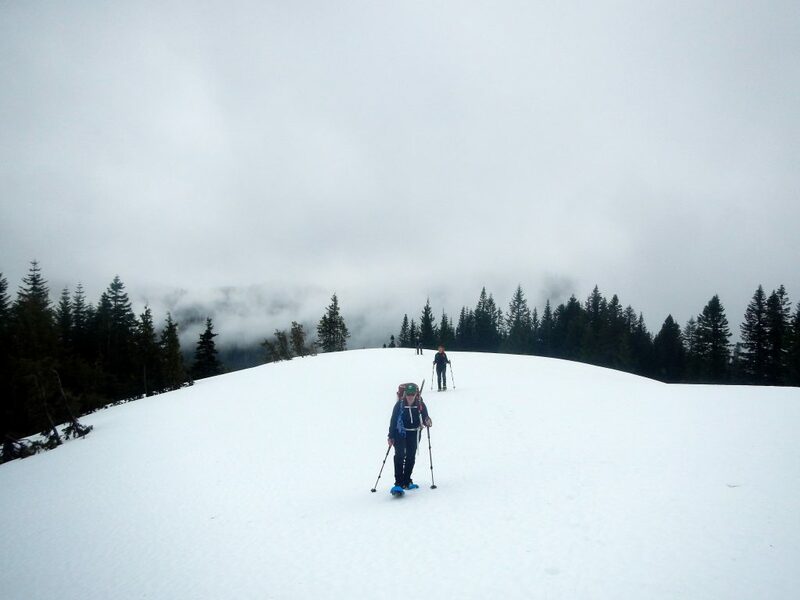 We started in snowshoes but soon realized it would be easier without them, so we stowed them on our packs. Well, not before doing a little dirt-shoeing first. 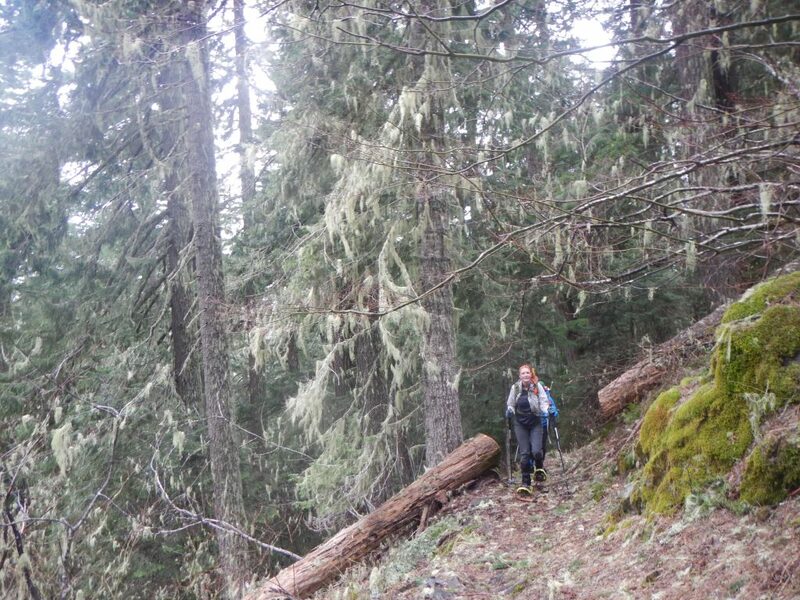 Eventually we reached continuous snow and did a little route-finding to stay on trail in the trees. In an hour and a half we reached our first big view of Cone Peak. From here it was clear that we’d have to choose our route in order to stay on the snow, but there was a big enough snowpatch to make it worthwhile. We continued across the blank, white canvas towards our destination. At the base of the cone we swapped out snowshoes for crampons, strictly for the practice. For one person in the group, this would be her first time putting on and using crampons. It was essential to practice this now so that she wouldn’t be learning for the first time on St. Helens. Up we went. Aaron led the way to the ridge, kicking steps as far as he could before hitting dirt. 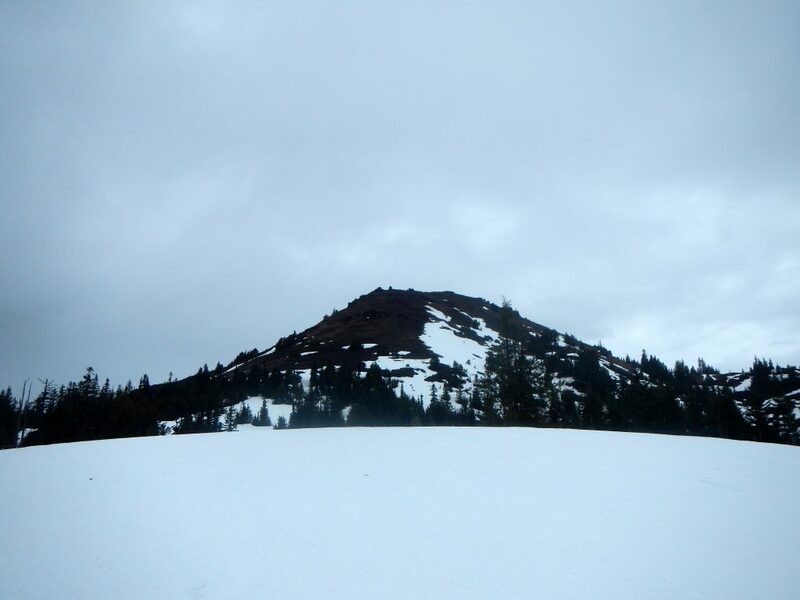 Atop the snowfield, we removed crampons and walked the remaining ridgeline to the summit. Here we could see all the low-lying hills beneath the clouds, which shrouded all the high peaks today. After a short break and the obligatory summit selfie, we returned the way we came. It wasn’t great practice for hiking up a snow-covered volcano, but it would have to do. We did get a sense of how slow gear-changes can be and how to move across a steep snow slope. I hope that we get some good conditions on St. Helens and that my team feels ready for the challenge. 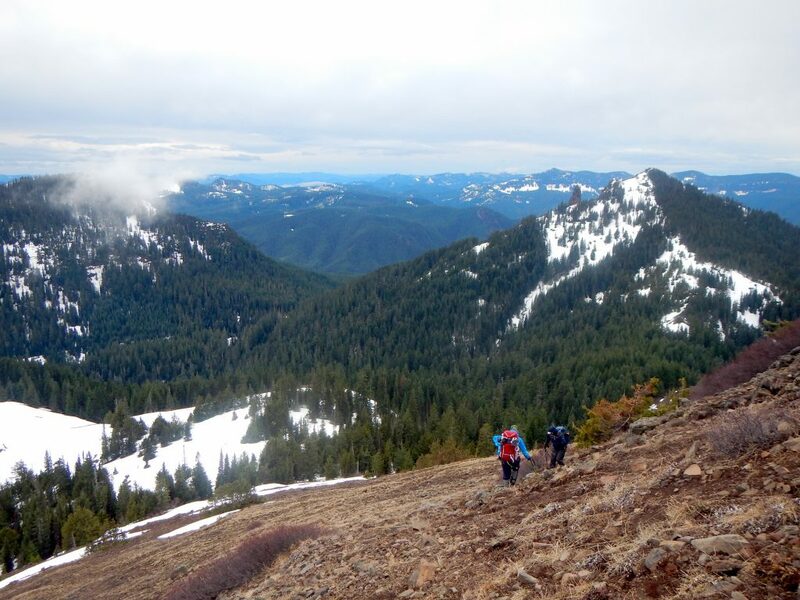 This entry was posted in Hiking, Oregon and tagged hike366 on March 6, 2016 by Jess B.